The king of software is clicking on all cylinders. 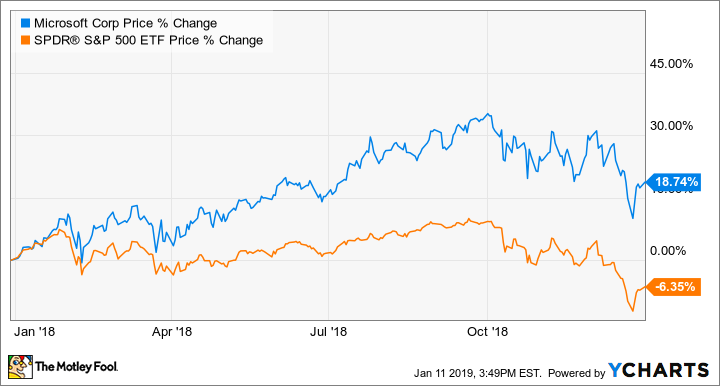 Even with the market turmoil toward the end of the year, shares of Microsoft (NASDAQ:MSFT) delivered an 18.7% return to shareholders last year, according to data provided by S&P Global Market Intelligence. The software giant continued to make advances in its transformation to a subscription and services-based business, which powered an impressive acceleration in revenue growth last year. Total revenue reached $110 billion in fiscal 2018 (ending in June), growing 14% over the previous year. Strong top-line growth fueled 18% year-over-year growth in adjusted earnings per share. Windows 10 S for schools. IMAGE SOURCE: MICROSOFT. These results come as Microsoft is seeing impressive growth in its Azure cloud business, which grew 76% year over year in the fiscal first quarter ending in September. Microsoft is now the second largest cloud provider in the world. Meanwhile, other areas of the company are performing well, too. The Productivity and Business Processes division grew revenue 19% in the fiscal first quarter, driven by growth in subscribers to Office 365, as well as a robust increase of 33% in revenue from LinkedIn. The largest revenue contributor last quarter was the more personal computing segment, which grew 15% year over year, led by growth in Windows (up 12%), gaming (up 44%), search advertising (up 17%), and Surface devices (up 14%). Overall, Microsoft is looking strong. Total revenue growth of 19% year over year in the first quarter of fiscal 2019 represented an acceleration over the year-ago quarter's 12% growth rate. Given the momentum, it's clear why the stock climbed 18% last year. Microsoft's surge in the cloud-computing industry and its ongoing strength in core businesses, such as office software and gaming, suggests the software giant is finding its second wind after experiencing slowing growth a few years ago. And even after last year's share-price gains, the stock still looks like a buy, trading for a forward price-to-earnings ratio of 20 times next year's earnings estimates. That's an attractive valuation for a company that's expected to grow earnings 13% per year over the next five years. Check out the latest Microsoft earnings call transcript.